I'm no coffee expert, but every since I started drinking my coffee black, I've come to really appreciate a well brewed cup a joe. My recent obsession has been manual brew coffee- automatically falling in love with every coffee shop that offers pour overs (aka Hide and Seek coffee). Although I use the pour over method at my family home in Japan, my wonderful friend Jeremy bought me an aero press for Christmas, and it has been my goal to perfect an aero press brewed cup every since. "Life is too short for anything less than stellar coffee and phenomenal friends." This post marks the beginning of my new series: INTENTIONAL LIVING. It's about enjoying the good things in life and doing simple things with the utmost care and love. It's amazing how much joy you can find in the daily tasks if you take the time to be intentional with the little things. Lets start with coffee! Here is how I make my morning cup a joe. The first step is to gather the supplies, the aeropress comes with all of the lovely gadgets I labeled above. 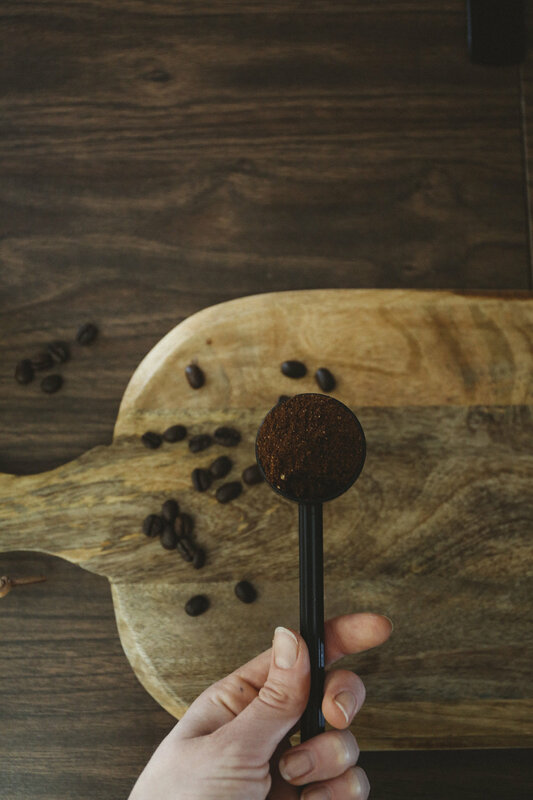 Essentially, the aeropress was made to combine the elements of pour over and french press coffee, creating a bold but uniquely smooth brew. It's convenience is ideal for the traveler, adventurer, and single brewer, but it wouldn't work for someone aiming to make a huge pot of coffee to share. The success of my morning coffee often has a huge part to do with the coffee roast I'm brewing. I often go for the classic kicking horse or level ground coffee, hitting a solid level of quality and taste. This week however, I treated myself to Cafe Fantastico's Hide and Seek roast, so far it seems a bit lighter than what I usually go for, but I'm loving it! (The aeropress calls for a fine grind). Set up your aeropress by putting a microfilter into the basket of the brewing chamber. Keep your plunger and other materials close. Pre-heat the brewing chamber by pouring hot water into it and into your cup. Swish the water around your cup to pre-heat your cup. Finish off by dipping your plunger in water to get it ready and heated as well. 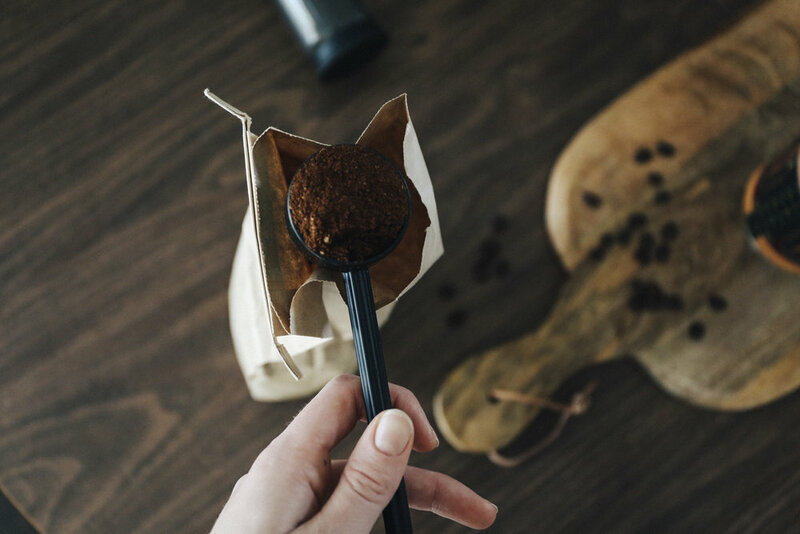 Take one heaping scoop of finely ground coffee beans and put it in the chamber (using the funnel or not). Pour the hot water over the grinds evenly and at a fairly quick speed until the water level reaches the number 4. This should not take more than 10 seconds. Give the mixture a quick stir, and then stick the plunger into the chamber, pulling up slightly to create an air tight seal. Wait a couple minutes before taking the plunger out, giving the mixture another stir, and then pushing down on the plunger slowly to finish the brewing process. And there you have it: A beautiful manually brewed cup of coffee! Some people like to top up the brew with a bit of hot water, but i often prefer leaving mine extra strong. (Mug from a local store called Migration, courtesy of my beautiful friends Cassie, Devi and Tamara).